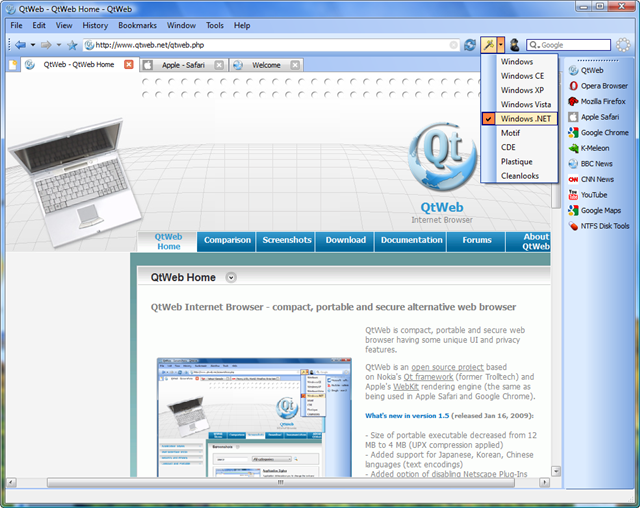 QtWeb is a fast, secure, compact and portable web browser with some unique user interface and privacy features. QtWeb is free, non-commercial and open source project based on Nokia's Qt framework and Apple's WebKit rendering engine (the same as being used in Apple Safari and Google Chrome). Single EXE - very compact (4MB). Has minimal dependencies - can be run from bootable CD/DVD (BartPE, Boot Disk). Strong Privacy. Built-in Torrent client. Internet TV Player lets you watch 800+ free Internet TV on your PC. Qweas is providing links to QtWeb Internet Browser 3.7.5 as a courtesy, and makes no representations regarding QtWeb Internet Browser or any other applications or any information related thereto. Any questions, complaints or claims regarding this application QtWeb Internet Browser 3.7.5 must be directed to the appropriate software vendor. You may click the publisher link of QtWeb Internet Browser on the top of this page to get more details about the vendor.